Editable royalty-free map of Albania in vector-graphic online store. 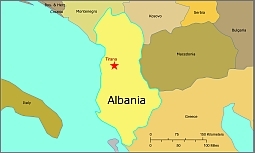 Albania is one of the smallest countries in Europe. It is located on the west coast of the Balkan peninsula in southeastern Europe along the Strait of Otranto, which connects the Adriatic and Ionian seas. More than 70 percent of Albania’s terrain is rugged and mountainous, with mountains running the length of the country from north to south. The remainder consists mostly of coastal lowlands, of which a large portion is former marshland that was reclaimed during the Communist era and is now agriculturally productive land. The largest lake in the Balkans—Lake Shkodër or Scutari—is found in Albania, as well as the deepest (Lake Ohrid).Albania is located on the Eurasian Tectonic Plate. Shifting of the earth along the fault line that roughly defines the western edge of the central uplands causes frequent and occasionally severe earthquakes. Major damage occurred over wide areas in 1967 and 1969. MOUNTAINS AND HILLS Mountains Albania’s mountains, located to the north, east, and south of the coastal lowlands, can be divided into three groups. The northernmost group, the North Albanian Alps, are an extension of the Dinaric Alpine chain and the Montenegrin limestone plateau. Some of the mountains in this region reach heights greater than 8,800 ft (2,700 m). These limestone peaks, popularly known as “the accursed mountains,” are the country’s most rugged. The central uplands region extends south along the Macedonian border from the Drin River valley, which marks the southern boundary of the North Albanian Alpine area, to the southern mountains.Although the central uplands are generally lower than the North Albanian Alps, Albania’s highest peak, Mt. Korabit, is found in this region. The southern highlands are lower and more rounded than the mountains to the north. At the southernmost end of Albania, south of Vlorë, the mountains reach all the way across the country, meeting the Ionian Sea. Rivers Albania’s major rivers are the Drin, the Buenë, theMat, the Shkumbin, the Seman, and the Vijosë. They all empty into the Adriatic Sea. The Drin is the longest river in the country, while the Buenë is Albania’s only navigable river. CLIMATE AND VEGETATION Temperature Albania is located in a transition zone between a coastal Mediterranean climate to the west and a continental climate to the east, so its climate varies. The coastal plain has mild, rainy winters and hot, dry summers, moderated by sea breezes. In the mountains, continental air masses produce warm to hot summers and very cold winters with heavy snowfall; summer rainfall is also heavier in this region than on the coast. Albania’s average annual temperature is 59°F (15°C). In addition to its forests, Albania is rich in mineral resources including copper, iron, phosphates, chromium, coal, petroleum, and natural gas. The Drin River has been dammed to produce hydroelectric energy.